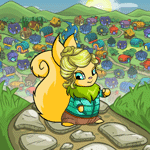 There are hundreds of petpets out there in Neopia, all perfectly worthy of being your beloved Neopet's new petpet. But how do you go about choosing the right one for your pet? A five kilometer run! Inna broke into a broad smile. She was one of the fastest runners at Neoschool.